Celtic’s 3-0 win in 28 games on the road marks a Champions League high for a team who tremendously struggled to enjoy success outside. On the other side, this loss signed a major blow for Anderlecht in their run for Group B’s third place. Above all, Anderlecht’s poor performance – where the Violets were dominated from the kick off – confirmed that Belgian side got a long way to come back to glory days of ‘70s and ‘80s. Anderlecht’s abysmal start of the season left them languishing seventh in the Jupiter League and without a manager as Nicolás Frutos is serving as caretaker manager after Swiss, René Weiler had been sacked. Frutos’s tactical approach at Constant Vanden Stock Stadium put emphasis on defence and this approach has been evident also against Celtic in their Champions League clash as the Argentinian gaffer lined up a side featuring five defenders allowing Brendan Rodgers’ team a huge amount of ball possession. The aforementioned defensive approach suggested Frutos were aware of Anderlecht’s defensive friability. That said, Belgian approach initially worked as it took 30 minutes for Anderlecht’s netminder Frank Boeckx to be called into action. Unfortunately for Frutos, it was just an illusion. In fact, Anderlecht’s defensive castle felt down when Olivier Ntcham – again in central midfield, replacing Stuart Armstrong – delivered an amazing pass which led to left-back Kieran Tierney’s cross that sealed Leigh Griffiths’ opening score. The Frenchman looked changed and improved since Brendan Rodgers left him pushing higher up the field mixing his play with Scott Sinclair but Anderlecht’s defensive effort was poor there as Celtic found the perfect way to penetrate an unready five-man backline: through a vertical pass that hit them in the space between the wing-back and the centre-back and with a pass towards the weak side where the opposite wing-back was lacking. When Olivier Deschacht miscontrolled a pass from Leander Dendoncker allowing Patrick Roberts to double the score in the early second half, it became clear as Anderlecht’s hopes to restore parity have been gone. Once yet this season, the Belgian champions showed a dreadful defending play and Frutos can’t blame the first-half injury occurred to centre-back Uros Spajic for explaining this tactical fiasco. In fact, Violets’ defensive phase has been in weak since the start of Jupiter League as they allowed as many as 10 goals in 8 games played. And against the Hoops the five-man backline were worse than expected both centrally and out wide, where full-backs Denis Appiah and Alexandru Chipciu have often been outplayed by Cetlic’s wingers. “It’s not a good thing to take such a defeat especially at home,” Frutos said. But, although Anderlecht’s defensive effort have been a concern an even more worry – should it be possible – came from their offensive side. Even if the Violets won their last two games since the sack of Weiler, the offensive production is still lacking over there as testified by their 10 league goals scored (as many as the 13th placed Lokeren). Champions League’s game against Celtic was a quick reminder that Frutos still have plenty to work to do as an attempt from Sofiane Hanni was Anderlecht’s only thing close to a scoring opportunity. The below pass map taken by @11tegen summarises the home side problem with ball circulation as although Adrien Trebel and Pieter Gergens did a good job in the middle they rarely have been able to link the centre with the wide areas. 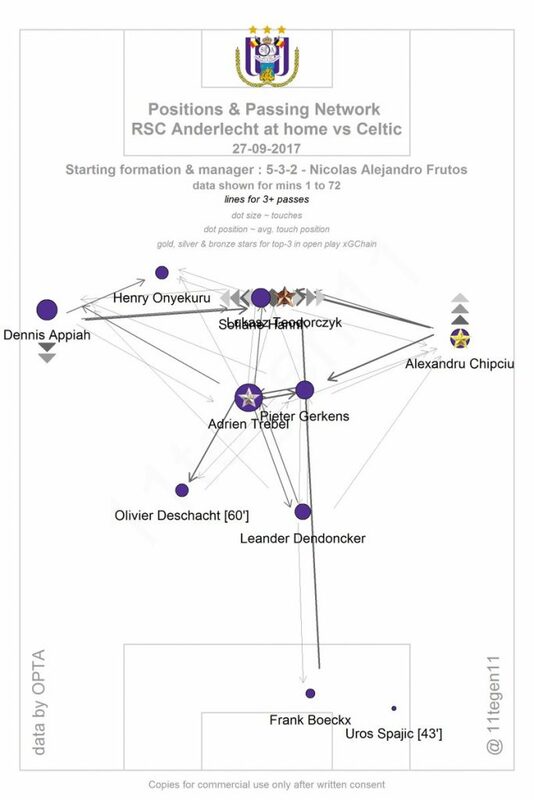 Anderlecht’s manager tried to invert the run of play by switching to a more proactive 4-2-3-1 with Nicolae Stanciu on, still putting emphasis on defensive resiliency and on crossing from wing-backs in attack. However, unsurprisingly, it didn’t work as Belgian side’s troubles up top stayed. This summer transfer campaign didn’t help as Bruxelles’ club sold their top player Youri Tielemans to Monaco. The newcomer Łukasz Teodorczyk still couldn’t live up to the hype as the Polish under-performed so far scoring just 0.3 league goals per game and having yet to net the goal in Champions League. True to be told, he rarely enjoyed good assistance from his teammates. Frutos had four games to prove he deserves the role of Anderlecht coach on a permanent basis and is clear he’s not proved it yet. Surely, he won a couple of league games but the performances were so-so while his Champions League appearance has been not better in term of result and display. He needed an impressive performance against Celtic to solidify his candidacy and he didn’t produce it. Above all, he was highly criticised for his defensive approach, the same reason that led the board of direction to sack Weiler. Frutos likes proactive football but his game plan against Celtic showed else as his side sit deep in a 5-3-2 low block when out of possession and rarely went more offensive with the ball at Belgian players’ feet. That were the same five-men backline that Wiler unsuccessfully deployed against Bayern, when he lined up Sven Kums at sweeper. So, although the offensive potential Anderlecht possesses this season decreased, Frutos could switch his team to a permanent 4-2-3-1 or a 3-4-3 to get easier for Anderlecht to get the ball progress up top. Within a more proactive 4-2-3-1 both Henry Onyekuru and Teodorczyk could receive more balls up front, taking the advantage to have an attacking midfielder (Stanciu?) just behind them. Obviously, in a three-man attack one between the Polish and the Nigerian should play wide but Frutos could let the chosen player operating through the half-space, reducing their defensive duties. Otherwise, the Argentinian head coach could line up Onyekuru and Teodorczyk 1-1, with one of them operating as No.10. It could lead Stanciu on the flank, a spot where the Romanian is anyway able to play. That said, whatever formation Frutos will decide to line up next games, he absolutely need to get Anderlecth able to get the ball progressing through the middle. Positional play lacked against Celtic as rarely you see a side that lack positioning into the half-spaces as Belgians did. That happened while ball possession and movement through the open spaces are pivotal to increase Anderlecht’s scoring chances.